The much awaited Ganges retreat will be commencing from tomorrow at Ganges, Michigan, USA. So, today we are getting ready.As we are all ready with preparations, suddenly we saw one of my disciples coming home from office in a hurry. 'Whats the matter?' - I asked her. 'I forgot where I placed my car keys.So, I took A's car to office in the morning. I searched everywhere in the house but to no avail. I just forgot where I kept them yesterday.' She replied. Call the insurance guys. They will come with duplicate keys' - Shouted 'A'. They started searching all over the house again. Exactly in such times of confusion, we need to take the help of Prashna Tantra to clear the deck. If not now, when will the science of Astrology comes to our rescue? Immediately I looked at the current planetary positions on my mind's screen. To be able to do this feat, one needs to keep an everyday watch on the movement of planets in the heavens. If we follow their trail, we can look at them anytime anywhere in our mind. Now, Mercury is in retro state, creating confusion, forgetfulness,miscommunication,retracing one's steps back and forth and many other similar situations.Moreover, we are now under Amavasya shadow. What more is needed to create confusion? Gemini is rising now at Auburn Hills, Michigan, USA showing the wavering mind of the querent. The issue at hand is indicated by Moon as something related to short distance travel, he being the 2nd Lord which is 12th to 3rd. However, Sun as 3rd Lord is exalted in 11th telling us that the forgetten object will be found very soon. Among the two auspicious planets, Jupiter is in 4th kendra and Venus in 10th Kendra, both hinting that the object will be found very soon. But Rahu in 3rd house is casting his magic of illusion and shadow on the issue at hand. Now we need to find out where the keys are? Lagna is in 2nd drekkana indicating that the keys are very much in the house. Now we need to find out in which direction they are located? 'Did you search everywhere in the house?' I asked her. 'Sure. I searched at all the usual places.' she replied. I wanted to ask my friend Karna Pisachi. So I chanted her mantra once in my mind. She instantly appeared on my mind's screen smiling a naughty smile. 'Where are the keys' I asked her somewhat rudely. 'Who knows? Anyway, you are taking the help of Prashna Tantra. Do it. Why do you ask me?' It replied with the same devilish naughty smile. 'Ok. I will see you later on.' I said and concentrated on the Prashna Chart. There are three planets in 11th Labha sthana viz., Sun, Moon and Mercury. Among them, Mercury is in infancy indicating mental confusion of the querant, Sun in youth showing success of Prashna and Moon in old age showing mental confusion again. These three planets indicate East, Northwest and North respectively. I looked at the TV stand in the East which is empty. Then I searched on the sofa in the North but could not find the keys on it. 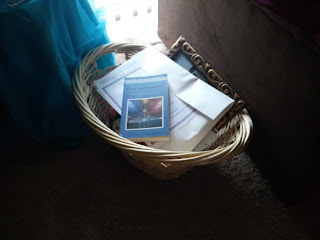 Then my glance fell on the cane basket with some books and papers in the Northwest.As Mercury is karaka for books and papers, my gut feeling immediately told me that the keys are in that basket. True to it, when I searched the basket, I found the keys at the bottom of it, covered by books and papers. I took them and handed over them to my disciple who are frantically searching for them all over the house. 'Thank you so much. Where did you find them?' she asked with a beaming countenance. 'Certain things are to be kept secret always. You should not press me to tell you how?' I replied her smiling. 'I have been searching for the keys all over the house right from the morning. Thank God that they are found finally!! See you. Bye' saying so she took them and drove to her office. Now that the keys are found and trouble averted, I sat down quietly and started thinking. Suddenly I heard the naughty laugh of Karna Pisachi in my ears. 'Oh ! Its you again !' I thought in my amusement. They say that spirits gain strength during New Moon days. So all this is its handiwork !! My God !! It is playing practical jokes on me and my companions ?? How dare it is ?? I enjoyed its logic. Laughing to myself I excused its practical joke on me. So What? Prashna Tantra has come to our rescue again in our daily life. This is how one needs to take its help in times of need. What is the use of learning Astrology, unless it is used in times of need in our daily lives? Leo is royal sign, symbol of power, desire to rule and command others, it signifies disastrous consequences when afflicted. Positive keywords for leo are confidence, warmth love, protection and creativity. Negative keywords are vanity, dictatorial tendencies, outright controlling, extravagance and egotism. Leo rules Government houses, head of the government authority, state ministers, politico-elite people, war-like events, shooting massacres, vehicular explosions and collisions. Eclipses in the Fiery sign threatens the destruction of Cattle and Sheep, exile or imprisonment or murder of some notable or elite or political person or great ruler. Much discontent and dissension among the people. Movements of armies, fighting, fires, fevers. Eclipses in the Fixed sign will have a very lasting effect. Eclipses in the First Decanate of Leo (Lord of First Decanate of Leo is Sun) denotes the death of some famous prince, kingly person and scarcity of corn. Events pertaining to Royalty or government heads, leaders may occur around or after this eclipse ( generally solar eclipse infers diverse events like deaths, crises, suppression, uprisings, attacks on the government's),Increased government or executive intervention. Countries come under the influence of Leo sign are France, Italy, Romania, Sicily. Cities come under the influence of Leo sign are Chicago, Philadelphia, los angeles, Bristol, Mumbai, Prague, Rome, Ravenna, Bath. The effect is more powerful in those countries where the eclipse is actually visible, and also in those countries and cities ruled over by the sign in which the eclipse falls. Leo Sign has Rahu, Moon Sun Mercury saturn aspects this with his 10th aspect. Cancer sign has Venus and Mars; Virgo has Jupiter & Scorpio has Saturn. Ketu in Aquarius. In the eclipse chart if more malefic aspects among the planets stronger the impact of malefic on the areas of solar eclipse path travelled and impact on the areas represented by sign leo. Events that triggers the energy is the square of the transiting Sun to the transiting Node..
Leo sign has Scorpio, Aquarius, taurus in square to it so when Transit sun transits these .. they give scope to triggering of events. Saturn square to Sun, Mercury, Moon Rahu. As Saturn (airy) a malect casting his 10th aspect on four planets(Sun, Moon, Mercury(R), Rahu) in Leo sign Sun (Fire) in leo sign(fiery) may induce major fires, National pride events (since sun is Pride) like wars and space activities....Mountain eruptions, Fiery events...earthquakes(as Saturn in Scorpio).. Moon represents powerful response by people (Masses) in contrast to the solar themes of strong government presence. Natural disasters(Rahu in fiery sign), political, people events, Transportation (Mercury). Pluto is in angle to Sun Moon Mercury Rahu, this indicates a turning point on the lives of mass people and the impact will last for a long period of time. Strangely same planetary conjunctions in the Sign Leo happened in the year 1793around September when solar eclipse occurred on Sep 5, 1793. Mundane astrology ...countries signified by Sign Leo are France…. Eclipse paths can be superimposed on A*C*G maps. The effect is similar to that of an eclipse contacting a planet-the eclipse energizes it. The eclipse path energizes the planetary A*C*G lines at the point of intersection. A planetary MC line through a country can also indicate issues of national prestige or how a nation is seen by its neighbours or would like to be seen. Mars on MC.. political fight,Wide range of general martial events including fires, violent explosions, earthquakes, violent accidents, high profile deaths by inflammatory illness or by violence(shootings), volcanic eruptions. Sun on MC - Involving for increased( may be excessive) government or executive intervention. Diverse events (deaths, crises) centered on Presidents, royalities, any heads of state, major fires. Moon on MC - Powerful response by the people, moved emotionally. Mercury on MC - Vehicular events, wind disasters and travel tragedies. Saturn Square MC - Saturn stands out for all categories of events that involve significant loss of human life and costly property damage. Neptune/IC Line and the Pacific Ring of Fire - their conjoined place is prone to Earthquakes. The great eclipse path on the pacific ring of fire which is a zone for tectonic changes and a cause for earthquakes. Uranus-Pluto signifies the sort of event that the news media calls a “major shakeup.” It is revolutionary, revising, remapping, anti-establishment, often anti-government, and generally overthrowing. The solar eclipse path travelled in the countries india china in 1999 July and we can see significant development in the economies of both countries after 1999. The total solar eclipse path travelled in Gujarat state (India) and there was enormous growth in next 10-15 years in gujarat. Next Solar Eclipse is in August 12 2045 lasting for 6 minutes. The longer the duration of Eclipse and the impact of the events that are going to happen will be for long lasting years.